Oh, how I love soup this time of year. And even though I live in CA and the weather has been in the 70’s this week (don’t hate! ), I still crave this velvety, rich, and creamy roasted sweet potato soup while I read all the news stories about everyone else surviving the blustery winter. It’s hearty and incredibly filling, while still being low ing fat and calories, and full of fiber and vitamins. The little touch of orange zest adds just the right kiss of flavor to the slight smokiness of the roasted sweet potatoes. I also like to add a sprinkle of ground chipotle powder on top of each serving to add a kick of heat too. This is the perfect soup for when you don’t feel like chopping lots of vegetables or slaving over a simmering stew all day. It’s quick, easy, and absolutely divine. Enjoy! Sweet and creamy with a gentle touch of citrus and smokiness, this sweet potato soup is heavenly. Plus it’s loaded with vitamins and minerals and is incredibly filling, while still be low in Weight Watchers Points. Preheat oven to 425 degrees. Line a large baking sheet with parchment paper and most with cooking spray or an olive oil mister. Spread out diced sweet potato evenly on baking sheet, mist lightly with an olive oil mister, and sprinkle with salt and pepper. Roast in oven until potatoes are tender and begin to brown on the edges, about 30 minutes. Place potatoes, milk, zest and broth in a blender or food processor and puree until smooth. Pour into a small saucepan to re-heat if necessary, and season as desired with salt and pepper. Divide evenly into 6 serving bowls, and sprinkle with a dash of chipotle powder just before serving. Your recipes have always delivered! I love coming here and I don’t have to count calories or points – makes my life so much easier – thank you thank you thank you! Can’t wait to try this soup – when you say diced do you mean like 1″ cubes or really small dice? Thanks so much for the kind words! To answer your question, 1″ cubes are fine. The potatoes will soften when they are roasted, so they don’t need top be super small in order to puree easily. I just found your blog and I’ll have you know I just spent the past 30 minutes going back through your posts and pinning almost every recipe! Everything looks so good! 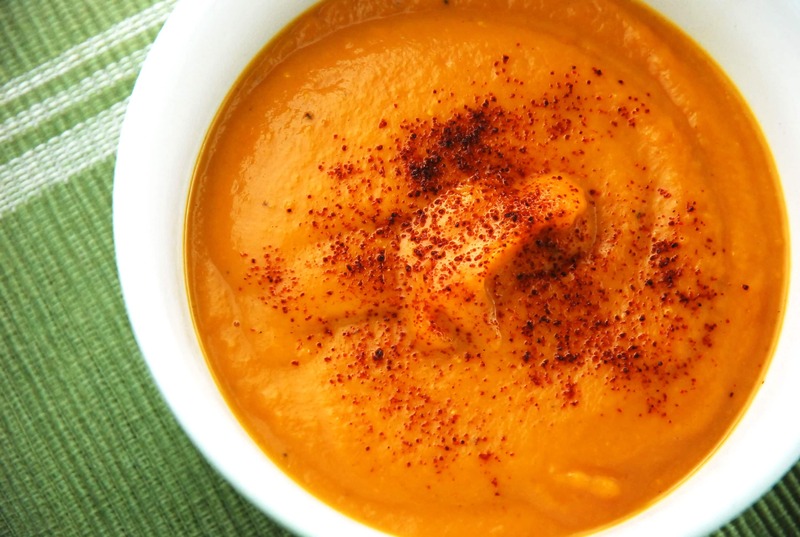 I MUST try this soup; I love anything sweet potato!! Just wondering if you think skim milk would work just as well in this recipe. I follow Simply Filling on WW and that would make it totally Power Foods with skim milk. Keep these delicious recipes coming — I LOVE THEM! I made this today with skim milk.. It was delicious! The new format looks great, but it does not print properly. A simple recipe which should be one page ends up with three pages and lines that go through photos.